Back by popular demand EYE-D Club Master Sunglasses! This style is a plastic frame with a unique design and plastic material. The craftsmanship of this item is excellent. 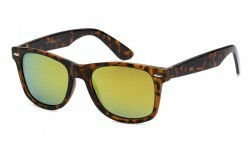 It comes with basic color frames in black, tortoise, and a multi color print. Buy cheap wholesale sunglasses from Sunrayzz Imports and profit now!